Elephant Retirement Park is home to retired elephants previously working in building yards. The functions of elephants in Thai’s society changed drastically since the government banned the use of elephants as labour. The camp founder created a sustainable habitat for the elephants to live in a safe and natural environment. Young elephants are never separated from their family units, and herbal medicines are used to keep them healthy to enjoy a better quality of life. There is a strict policy on the treatment of their elephants where there is no riding or beating of any kind. 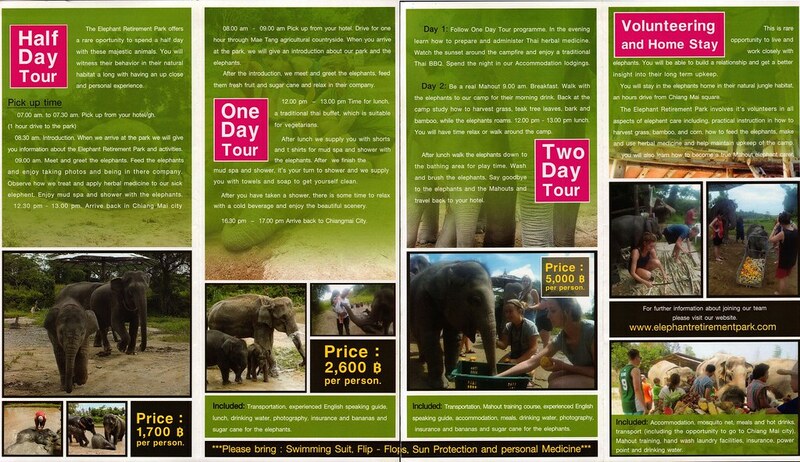 You can choose from their Half Day, One Day or Two Days elephant tour program. Walk, bath, feed, and play with the elephants and learn how to prepare food and herbal medicines for them. There is also a longer-stay volunteering program where you can learn everything about elephant’s care like a true mahout (elephant trainer) eg. harvesting grass, bamboo, corn to feed the elephants; make and use medicines, upkeep of the elephant camp etc. Contact Elephant Retirement Park (office in downtown Chiang Mai) for the latest package available. 5 Kotchasarn Rd., Lane 5, Chiang Mai 50100 Thailand. Elephant Retirement Park, Chiang Mai. 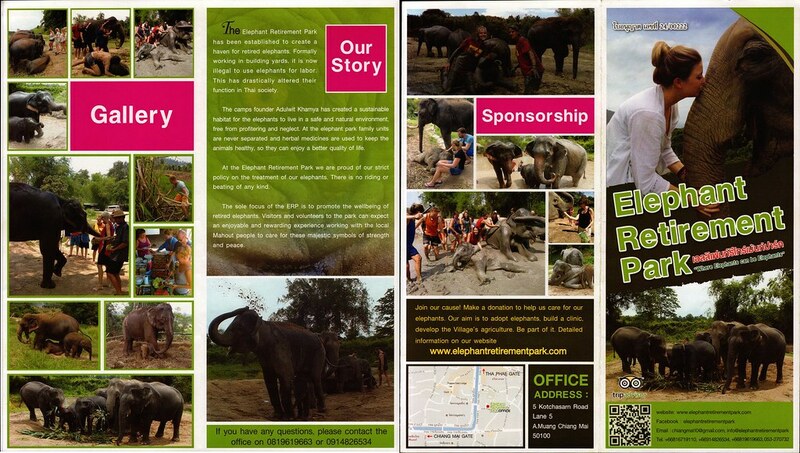 See the brochures of Elephant Retirement Park for more information. You may open and save the brochures for offline viewing on your computer or smartphone. Prices are subject to change. Check out useful Travellers Reviews about Elephant Retirement Park. Remember to write your review too and share your wonderful experience with the world.